December 4, 2012 April 2, 2019 Categories App Updates, Community68 Comments on Posh Protect. Satisfaction Guaranteed. We understand safety and trust are important to you. With Poshmark’s Posh Protect, you are protected every time you place an order on Poshmark. When you purchase on Poshmark, we don’t release payment to the seller until you tell us that you’ve received your order and it’s as described in the listing. You have 3 days after delivery to inform us if the item has been misrepresented by reporting the problem in the Poshmark app or website with supporting photos. Only after you’ve marked your item as ‘received’ do we release your payment to the seller. Item does not fit/changed mind: Unfortunately, if the item isn’t your style or doesn’t fit you, we cannot accept a return. You’re more than welcome to re-list the item on Poshmark! Trades & Offline Transactions (i.e. PayPal): Posh Protect does not cover trades or any transaction completed off of the Poshmark platform (e.g. paid through PayPal). When payment for the full value of items is not exchanged through the Poshmark platform, we cannot and do not guarantee that both parties ship and transact as promised. You bear all risks associated with any such transaction. Check your purchase promptly (within 3 days) to make sure your new item was accurately described in the listing. Mark your item as ‘received’ in the app if everything is okay. Contact us by emailing support@poshmark.com immediately if there is a problem with your order. Delay checking your item past 3 days. Mark your item as received if there is a problem with your order. Try to resolve any problems with your order yourself. Contact us first. We’re here to help. Remember, if the item you received is not as it was described in the listing, then you are covered under Posh Protect. 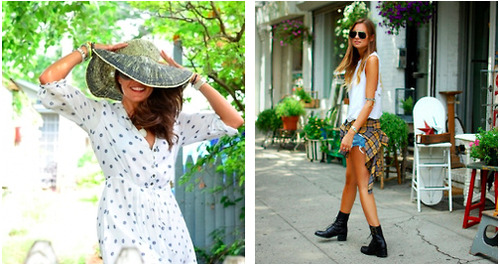 Introducing: Share Your Closet On Instagram! 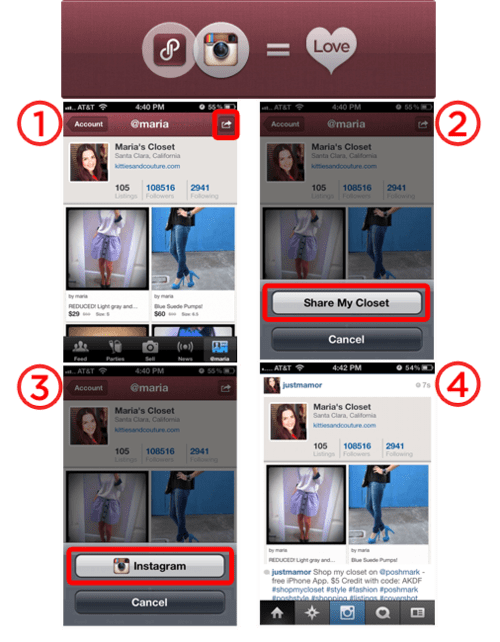 October 5, 2012 August 12, 2014 Categories App Updates, Community, PoshmarkLeave a Comment on Introducing: Share Your Closet On Instagram! As big (BIG!) 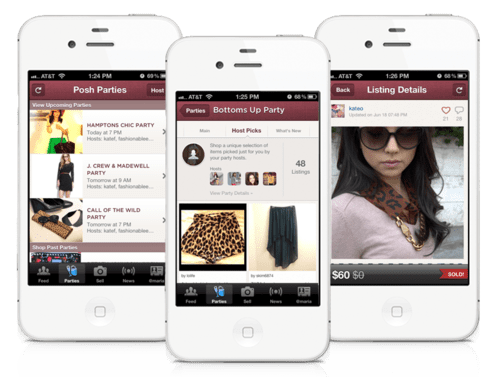 fans of Instagram, we’re so excited to announce the release of the latest version of our app (v.1.64), where we’ve given you the ability to share your Poshmark closet with your Instagram followers. Sharing your closet on Instagram is easy! Open up Poshmark, click on the tab to the far right, and select “My Closet.” Click on the arrow on the top right corner of your screen. Click on the “Share My Closet” button. Click on the “Instagram” button. Your Instagram app will now open with a picture of your Poshmark closet. Once you choose your filter, you’ll see that we’ve pre-populated the text field for you, including some of our favorite hashtags to help others on Instagram find your picture. Publish and you’re set! So what are you waiting for? Update to the latest version of the Poshmark app if you haven’t already, share your closet on Instagram, and make that money! NEW! Posh Party Showrooms and New Hosts! August 8, 2012 August 13, 2014 Categories App Updates, CommunityLeave a Comment on NEW! Posh Party Showrooms and New Hosts! Our Posh Parties just got a major upgrade! We’re beyond thrilled to announce the launch of our Posh Party Showrooms, curated collections of products that are added to or shared to a Posh Party, making it easier for you to discover and shop for new fashions and trends. But we’re not done! To help make our Posh Party Showrooms even more special, we’re introducing new hosts for our Posh Parties! 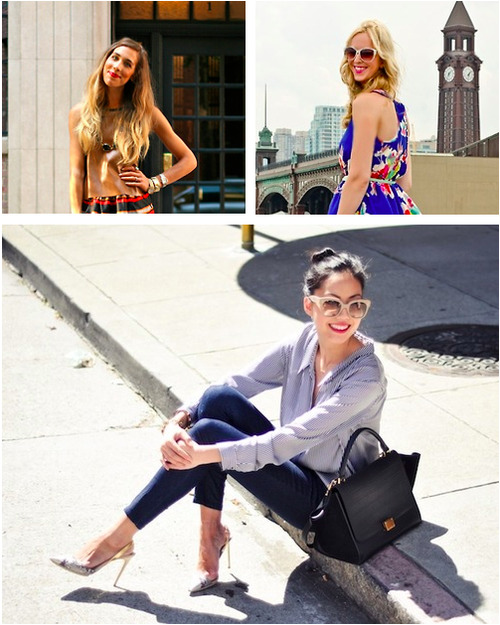 Ever wanted to have the chance to shop alongside your favorite style influencer? Well, now you can inside our Posh Party “Host Picks” Showrooms! Our fashion-savvy hosts will be scouring listings throughout the Posh Parties and hand-selecting their favorites, all of which will be curated for you in one place. Be ready to Posh Party-it-up with our first set of hosts: Anh of 9 to 5 Chic, Jessie of Style and Pepper, Christine of Court & Hudson, Danielle of We Wore What?, Christine of NYC Pretty, and many more to be announced soon!